The Junior League of Worcester (JLW) has been addressing needs in the community since 1925. 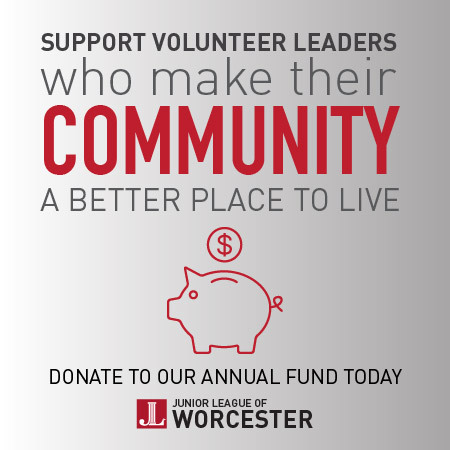 Gifts to the Annual Fund allow the JLW to continue to improve Worcester neighborhoods. Through our signature Food4Thought project, Kids in the Kitchen workshops, and our scholarship program, the JLW works as a tool to improve the city. The JLW trains its volunteers to help create many of tomorrow’s civic and community leaders. We hope you will consider giving a gift to the Annual Fund to commemorate more than 90 years of JLW service to the Worcester community. Through your donation, the Annual Fund provides essential support for the Junior League of Worcester. When you give to the Annual Fund, you are personally enabling us to continue serving the needs of the greater Worcester area.